I came across an online tool/service a while ago that promised to help you brand your online business. It is especially useful if you are branding your own name – personal branding. If you have an information business then I believe that since YOU are creating the information and of course your own personality and style goes into your products, then in effect YOU are your business. So using your name as a brand does make sense. This is what I have done and therefore I was interested to see what this tool could do. 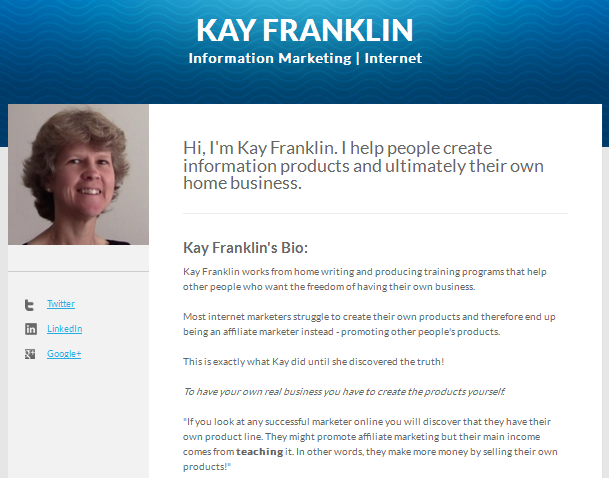 It is called BrandYourself.com and you can sign up for free and use it to boost 3 specific links in the search engines. If you want to boost more links, then you would need to upgrade. So I signed up for free to see what it was all about. Recently Google has been talking a lot about online reputation management and have provided a link for those individuals who want specific ‘online history’ to be removed! So if you have a negative result in the search engines that presents you in a bad light then you can ask for that specific result to be removed from the search engines. Obviously there is a lot of controversy here because keeping criminal records visible for example, is necessary to help protect the public or employers from potential harm. However, there are instances when this would be useful. Being able to manage your online reputation and in particular brand, would be a huge benefit. When you type your name into the search engine ideally you will want your sites to be on that first page! If your name is unusual then you are probably going to take up the top 10 positions. However, if there are other people with the same name as you and in particular famous people or those who have for whatever reason been in the news, then it is more difficult to get a position on that first page. Unfortunately we can’t go asking for these sites to be removed… If only! Over time you might begin to see your sites appear, especially as you create more and more content online and your business becomes more established. But sometimes it is difficult to get rid of some of those sites taking up room on the first search results page. This is where brandyourself.com comes into play. What Is The BrandYourSelf Tool? It is basically an online reputation management tool that you can use yourself to see what your sites are doing in the search engines. 1. You submit your links – such as Google plus profile, twitter, facebook, linkedIn, etc. If you don’t have any then the tool will take you through the process of setting them up and what details you should fill in. 2. The software analyses those links and tells you step by step what you can do to boost them in the search results. What I particularly liked was the way the software takes you through the process. It can all be done within the software window. You also get to understand the reasons behind WHY you are taking those steps. 3. The software will then track your results and keep you updated about the positions of the various links in the search engine. This is very interesting. Every now and then you can go in and identify whether links in the top 100 results are working for you, against you or if they are nothing to do with you at all! I found this particularly useful because I got to see what other sites were mentioning about me that I hadn’t known anything about – and it was all positive too! 4. In order to use this tool you do need to create your own brandyourself profile link. I guess it is to help them market themselves but it will also benefit you as it is a link with your business profile and you can put what you feel is important on this page. Of course what is the point in using this if it doesn’t provide any results! So far (in 2 months) I have seen my brandyourself profile rise by 80 places and ranking #24! Every week I have noticed a few pages appear in the top 100 that are positive results – in other words it is one of my pages or a page that has information about me on. I’m not sure that this tool has any bearing on that but it is interesting to observe! 4 links are now in the top 20 results that were not visible before. Since setting this up I have had 19 visitors to my profile page that I wouldn’t have had otherwise. I have had other visitors too but since I am a free member I am not allowed to have visibility to those. I think this is a good tool to use. Once you set it up it doesn’t require a lot of effort or time – if it did then I would probably say the effort was not worth it! However, 2 months is still early days. We are talking search engines results here! For the little effort it takes I think it is worth using even if it is to get yourself organized across all platforms and to make sure that your brand is consistent throughout. It will certainly increase your visibility online over time.